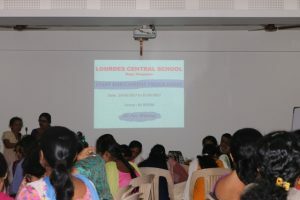 The workshop was held on 30 May 2017 for teaching faculty of Lourdes Central School. 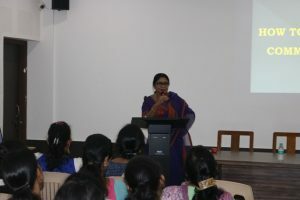 Renowned orator Ms. Rajina Dinesh and her associate Mr Kumble Narasimha Prabhu were the Resource Persons for the day. 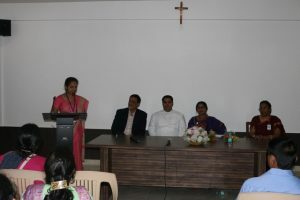 Ms. Rajina Dinesh started the session by expressing admiration for the Principal of Lourdes Central School for his quick decision in giving them an opportunity to spend their time and to share some of their expertise. She said that in order to be a best teacher one should be able to communicate well in English language which will lead us to build up our personality and command respect from the students and the society. For this we need to improve our stock of words and cultivate reading habits, usage of idioms and explore new words with its meanings and never to take a break from any language. Teachers should stay abreast of new developments in education by reading good books. 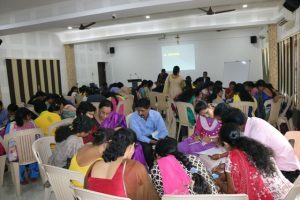 During the session she conducted activities like solving crossword puzzle and role play of interviewing a Personality which was really thrilling. Later the session conducted by Mr Kumble Narasimha Prabhu on ‘Positive Attitude’ which is very essential while dealing with the students. 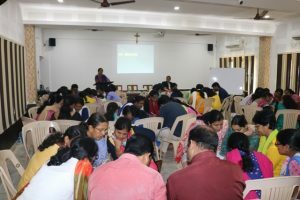 He motivated and encouraged teachers by giving examples of great personalities who have turned out to be successful in life in spite of all the hurdles they faced. He further advised teachers to stay away from people who have negative attitude and associate with the ones who would help you to grow. To uphold ethics and values of one’s profession, is how a teacher can succeed as a best teacher. He also added that teachers should stay physically and mentally fit by doing exercises, pranayama, yoga and healthy eating. He concluded by saying that we should plan our retirement by investing the savings judiciously for the economic growth of our country. 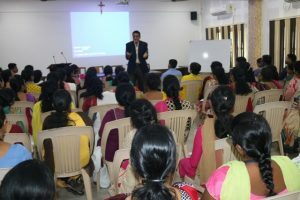 At the end of the session the teaching faculty was enriched with good learning experience of communicative skills.